Melt butter in a saucepan over medium heat. Cook and stir onion in melted butter until softened, 7 to 10 minutes. Bring a large pot of lightly salted water to a boil. Cook egg noodles in the boiling water, stirring occasionally until cooked through but firm to the bite, about 5 minutes. Drain and return to the pot. Snip bacon into small pieces with a scissors and cook in a large skillet over medium heat until crisp, stirring often, about 10 minutes. Cook and stir onion with bacon until translucent, about 5 more minutes; set bacon and onion aside, leaving drippings in the skillet. To Make Meat Mixture: Heat 2 tablespoons oil in a large skillet over medium high heat. Saute onions until golden brown, then remove from skillet and set aside. Add remaining 2 tablespoons oil to skillet and heat for 1 minute over medium high heat. Add beef and cook until browned, mashing with a fork to break into small pieces. Drain fat. Place beef, sauteed onions, salt and pepper in a blender and blend on high for 5 to 7 seconds; set aside. To Make Dough: In a medium bowl, combine flour, salt and egg and mix well. Stir in water, a little bit at a time, until dough is stiff. Knead dough for 2 to 4 minutes on a lightly floured surface. Roll out dough to 1/8 inch thickness with a rolling pin. With a glass or cookie cutter, cut out rounds about 3 inches in diameter. Place 1 tablespoon filling on 1/2 of each dough circle. Moisten edges of dough with a little water; fold dough over filling and press edges together, first with your fingers, then with a fork. Place ham in large pot and cover with water. Boil to make ham broth. Cut ham into cubes and set aside. Place potatoes in broth to cook while you are mixing dough. In large mixing bowl, mix flour, eggs, and milk to form soft dough. You may need to add a little more milk. Roll dough to 1/8″ to 1/4″ thickness (depending on preference). Cut dough into 1″ by 3″ rectangles. Drop dough into broth one piece at a time. Cook until dough is done. ( 13 1/2” x 9 1/2” x 1/2” ) with waxed paper. Split batter between 2 pans and bake at 350 degrees for 12 minutes. Place the cabbage in a stockpot with enough water to cover. Add 1/4 teaspoon salt to the water and cabbage. Bring water to a boil over medium-high heat. Turn cabbage every 2-3 minutes and remove leaves that separate from cabbage and place in a strainer to cool. Boil until all the leaves have cooked, about 15 minutes. Reserve 12 oz. of cabbage water. Trim thick center vein off of bottom of each cabbage leaf. In a large bowl thoroughly mix together, ground beef, ground pork, rice, chopped onion, fresh parsley, egg, garlic powder, salt, and pepper. Lightly pack a small amount of meat mixture and place in the center of the cabbage leaf. Fold sides over the filling and start at the stem and roll the cabbage up until the meat is encased. Repeat with remaining leaves and filling. Cut the leftover leaves into pieces and place into the bottom of a roasting pan. Layer the stuffed cabbage rolls over the cut leaves. In a bowl, mix the tomato sauce, reserved cabbage water, white vinegar, and white sugar. Cover roasting pan with aluminum foil. Bake in preheated oven until the ground beef mixture is no longer pink in the center, about 2 1/2 hours. Baste stuffed cabbage rolls every hour. When you quaff your first mug of raw cider from your own press, you’ll wonder why you ever used to buy that refined, watered-down liquid that the grocery trade sells under the name of apple juice. Homemade and commercial apple squeezin’s are about as much akin as frozen orange juice and the pulp-rich exudate of hand-squeezed Valencias. And as I mentioned earlier, having a handcrafted cider press isn’t a bad idea from the standpoint of giving your great grandchildren something to talk about. If you do nothing else with your cider press, use it to create the starting juice for a batch of Applejack. The Applejack recipe shown below was taught to me by a retired Marine pile driver named Ade Youngsman, and I can’t recommend it too highly. I’ve given the measurements in rather large units. Feel free to scale them down or change their proportions as you see fit, because after all, these amounts simply represent my best approximation of what I usually judge by sight and feel. Let your Applejack mature at 70° F until you just can’t wait any longer, then drink it chilled (in hot weather) or piping hot (at night or on a cold day), and don’t forget to eat those raisins, they pack a wallop! Mix the chicken, green onions, Cheddar cheese, pepperjack cheese, hot sauce, and ranch dressing mix together in a bowl; form the mixture into 1-inch balls with a scoop. Place the balls on a large, flat dish; chill in refrigerator 2 to 3 hours. Gently press the balls into the flour to coat and shake off any excess. Dip into the beaten egg and then press into bread crumbs. Place the breaded chicken balls onto a plate while breading the rest; do not stack. Boil water, butter, sugar, and salt together in a saucepan. Add mix and work it in until it is all incorporated and dough forms a ball. Transfer mixture to the bowl of a standing mixer and let cool for 3 to 4 minutes. With mixer lowest speed, add eggs, 1 at a time, making sure the first egg is completely incorporated before continuing. Once all eggs have been added and mixture is smooth, put dough in a piping bag fitted with a number 12 tip. Heat about 2 1/2 inches of oil in a heavy pan. Pipe dough into oil, making a free-form lattice pattern; cook until browned, flipping once. Remove cake from oil, drain on paper towels, and top with powdered sugar. In a medium bowl, cream together the cold cream cheeses and butter until creamy. Combine softened cream cheese, COOL WHIP whipped topping, powdered sugar and vanilla in a large bowl. Whisk until combined and light and fluffy. Preheat oven to 300 degrees. Place sausage links onto a sheet pan and bake for 25 minutes or until done; cut in half length-wise, then cut at an angle into 1/2 inch slices. 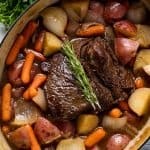 INSTANT POT ELECTRIC PRESSURE COOKER INSTRUCTIONS: Follow this recipe as directed, but instead of searing and baking the roast in a large pot, you’ll do all of this in your pressure cooker. Sear the roast as directed in step 2 using the sear setting on your electric pressure cooker. Cook the garlic, and deglaze the pan with liquids, and add in vegetables. Cook on high pressure for 60 minutes, followed by a 15 minute natural release. Then, switch the release valve to the venting position. Remove lid once steam has stopped coming out. Cook Rice with butter. Let rice cool. Beat eggs and pour into rice. Add ricotta, grated cheese, prosciutto and salt & pepper. Form into balls (a little bigger than Golf ball size) and push the cube of mozzarella into middle of ball. Roll balls in breadcrumbs and deep fry until golden brown. Makes approximately 30 rice balls. Grease a 9-inch square baking pan; set aside. In large saucepan combine first 5 ingredients. Stir over low heat until blended. Over medium heat, bring to a full-rolling boil being careful not to mistake escaping air bubbles for boiling. Boil slowly, stirring constantly, 5 minutes. Remove from heat, stir in peanut butter until blended. Turn into greased pan and cool.Makes 2 1/2 pounds. Hint: As with all fudge recipes, cooking time will vary depending on factors such as humidity and altitude. For best results, use the softball test to make sure the fudge has been cooked enough. Place 12 vanilla wafers on bottom of 12 paper lined muffin cups. Pour cream cheese mixture into muffin cups. Bake at 350 degrees for 20 minutes or until centers are almost set. Cool. Refrigerate 2 hours or over night. Top with fruit pie filling like cherry or blueberry. To Make Dough: In a medium bowl combine the flour, salt, egg and water. Mix all together to form dough; cover bowl and set aside. To Make Potato Filling: Place potatoes in a large pot. Add water to cover, bring to a boil, and boil for 25 to 35 minutes or until tender. Remove potatoes from water and mash. Place bacon in a large, deep skillet. Cook over medium high heat until evenly brown. Drain, crumble and stir into mashed potatoes. Stir in cheese and season with salt and pepper. To Make Sauerkraut Filling: Place bacon in a large, deep skillet. Cook over medium high heat until evenly brown. Drain, crumble and place in a medium bowl. Stir in sauerkraut, then sour cream. Mix well. 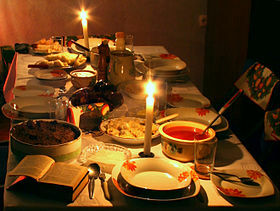 Barszcz – Its strictly vegetarian version is the first course during the Christmas Eve feast, served with uszka (tiny ear-shaped dumplings) with mushroom filling (sauerkraut can be used as well, depending on the family tradition). Żurek – żur with potatoes, Polish sausage (kielbasa), and Egg (jajko). Depending on the part of Poland it came from, it may contain mushrooms as well. This dish is also called żurek starowiejski (“old village”). It is frequently served with sour cream or by itself. Gulasz – stew of meat, noodles and vegetables (especially potato), seasoned with paprika and other spices. Kotlet schabowy – a pork breaded cutlet; made of pork tenderloin (with the bone or without), or of pork chop. Kotlet z piersi Kurczaka is a Polish variety of chicken cutlet coated with breadcrumbs. Kotlet z Indyka is a turkey cutlet coated with breadcrumbs, served with boiled potatoes and cabbage stew. Pierogi – dumplings, usually filled with sauerkraut and/or mushrooms, meat, potato and/or savory cheese, sweet curd cheese with a touch of vanilla, or blueberries or other fruits, such as cherries or strawberries, and sometimes even apples—optionally topped with sour cream and/or sugar for the sweet versions. Sałatka warzywna (sałatka jarzynowa) – vegetable salad, a traditional Polish side dish with cooked and finely chopped root vegetables, potato, carrot, parsley root, celery root, combined with chopped pickled or dill cucumbers and hard-boiled eggs in mayonnaise and mustard sauce. Also made with carrots, red paprika, corn, red beans, peas, potatoes, pickled cucumbers, onion, eggs, sausages, mayonnaise, mustard, salt and pepper.